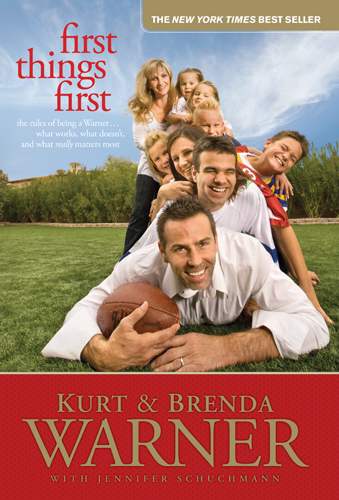 This is a book, not about the celebrity of Kurt Warner, but rather a book about a husband and wife doing all they can to put their family first in the midst of all the celebrity and daily life itself. Yes, it does touch on Kurt's career with stories here and there, but it equally shares of Brenda's background. Kurt is not the center of the book and clearly he is not the center of the family home. He is a husband and father before anything else. He and Brenda are partners... in parenting, marriage, and life in general. I found some very useful ideas for parenting. With seven children, one being a special needs child, they have found rules that work for them and share those rules in hopes that they will work for us as well... or at least show us how to find what works for us. They really stress to their kids, by rules and example, to put others first, treat others well, and be their best. They also set a good example of how to put your marriage first. Even above your children. They teach their kids by the way they treat one another. And what better way to see how a future spouse should treat you than by your parents' example. Love and respect are shown throughout the entire book. They each write part of every chapter. Kurt first, then Brenda. Two sides, but with common rules and respect for one another. If you're married, if you have a family or planning to start one someday, I would recommend reading "First Things First". There is so much great advice. If Kurt and Brenda can make it work in world of celebrity... there is hope for the rest of us!